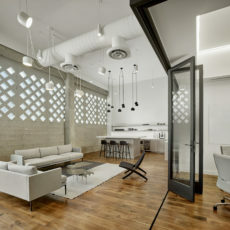 For their boutique office in San Francisco’s chic South Park, this VC firm wanted to embrace the light, airy space with a lightness in scale, and warm, fresh finishes. Unique, hand-selected soft seating and coffee tables bring a high end residential feel. Agile folding partitions enable flexibility as the kitchen, lobby and huddle rooms open into a welcoming and elegant event space. The workstations feature custom height-adjustable desks, and seating from Herman Miller and Geiger. 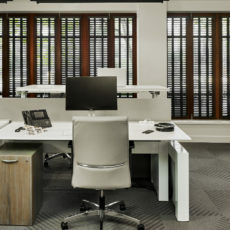 The custom, locally made reception desk and unique ebonized salvaged wood conference tables are fitted with seamlessly integrated AV technology, required for this leading-edge company.